The exact promotional code must be put into the promotion box at the checkout for discounts to apply. Please follow the instructions as we are unable to apply discounts retrospectively if you have not entered the codeword correctly. 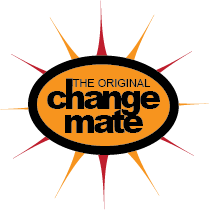 Change Mate from time to time might send you offers from their own other businesses or from businesses operating with the same principles and values as their own company. We do not sell or give away our database as we respect your privacy. Emails promoting other businesses will always be generated from our systems and nothing is outsourced. Should you receive an email directly from a company that has been featured in our own line of business it means that you have received their product as a special promotion, free of charge. * For GIVEAWAY promotions the spend price is exclusive of postage and handling and after all discounts have been applied. We aim to turn around orders within 24 hours of receiving an order Monday to Thursday. Orders received on Friday will be shipped on Mondays. Please check transit times with Australia Post as they vary depending on where the items are sent to. Regular post within Australia is $10. As the item is sent as a parcel there will be an article number assigned to it by Australia Post. YOu can track the progress of your parcel but you will not be required to sign to receive it. This means that Australia Post can leave it at your front door, put it in your mailbox if it fits or leave you a card for collection. If you choose this method of shipping please be aware that we will not be responsible if the parcel is lost in transit. Change Mate will not accept any claims for lost parcels if shipped with this method. Registered Post within Australia is $15. If you choose this shipping method you will need to sign to receive the parcel and your signature will be visible if a tracking is done. If there is a signature visible on the tracking it means that the parcel has been accepted by you or someone in your household. This shipping method is fully trackable. We will happily exchange an item or issue a credit note, if claimed within 7 days of delivery to you. Sale, clearance or discounted items cannot be exchanged. A copy of your receipt must be sent to us with your exchange. Goods for exchange must be in ‘as sold’ condition: complete, unaltered, unworn and in original packaging. We do not refund if you change your mind. Refunds may be subject to a re-stocking charge to cover costs we have incurred to deliver the order to you and in effecting the refund. Please email us, before sending the goods, to advise us of the product you want to return, it's purchase date and the reason you want to return it. Please wait for our emailed authorisation before returning the goods. To ensure quick processing please return all goods with a copy of the original receipt. Should the item drive back to us in less than perfect conditions we reserve the right to send it back to you after we receive payment for the new shipping charge.